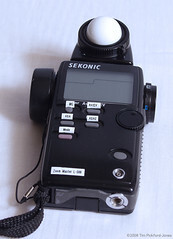 Sekonic is a Japanese manufacturer of light meters, still active today (2010). The company's roots seemingly trace back to June 1941. It was established as a stock company (kabushiki-gaisha) in June 1951 as Seikō Denki Kōgyō K.K. (成光電機工業㈱) or Seiko Electric Industries Co., Ltd., based in Toshima, Tokyo. 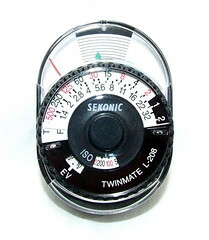 Its first exposure meter was the Sekonic P-I. In 1959 the company opened a new factory in Nerima, Tokyo, and created the sub-company K.K. Hachiyō Kōgaku Kōgyō (㈱八陽光学工業), with a factory in Ikeda, prefecture of Nagano, for the manufacture of exposure meters. The main company Seikō Denki Kōgyō was renamed K.K. Sekonic (㈱セコニック) in August 1960. It opened another factory in Ikeda in 1965. Picture by Nicholas Gray. (Image rights) Sekonic meter built into a Beauty Super L.
Picture by J. Hopper. 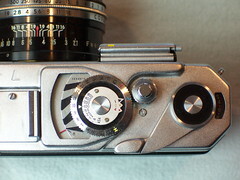 (Image rights) Yashicaflex S with built-in Sekonic meter. 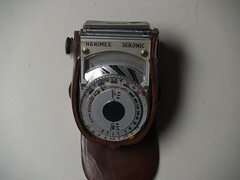 As well as light meters sold under its own brand, the company also made various OEM meters, sold under different names such as Prinz and Hanimex, whilst others were built into various Japanese cameras. Sekonic also made 8mm movie cameras and projectors in the 1960s, some of which were also sold under other names like Hanimex, others under their own Sekonic and Elmatic brands. In 1984, the Sekonic L-518 Digipro X-1 meter was used on board the NASA Space Shuttle. Column on Sekonic meters in Photo Art no.80, June 1955. Picture by HairyHippy. (Image rights) Sekonic L-758DR Digital Master. ↑ Company outline in the Japanese official website. ↑ 2.0 2.1 2.2 2.3 2.4 Chronology in the Japanese website. ↑ 3.0 3.1 3.2 History in the English official website. ↑ 4.00 4.01 4.02 4.03 4.04 4.05 4.06 4.07 4.08 4.09 4.10 4.11 4.12 4.13 4.14 4.15 4.16 4.17 4.18 4.19 4.20 4.21 4.22 4.23 4.24 4.25 4.26 4.27 4.28 4.29 4.30 4.31 4.32 4.33 4.34 4.35 4.36 4.37 4.38 4.39 4.40 Product list in the Sekonic official website. ↑ 5.0 5.1 5.2 5.3 5.4 5.5 Column in Photo Art no.80, June 1955, p.103. ↑ 6.0 6.1 6.2 6.3 6.4 Advertisement in Photo Art no.80, June 1955, p.105. ↑ 7.0 7.1 7.2 Advertisement dated 1954 reproduced at Shashin-Bako. ↑ 8.00 8.01 8.02 8.03 8.04 8.05 8.06 8.07 8.08 8.09 8.10 8.11 8.12 8.13 8.14 8.15 8.16 8.17 8.18 8.19 8.20 8.21 8.22 8.23 8.24 8.25 8.26 8.27 8.28 8.29 8.30 8.31 8.32 8.33 List of battery-operated exposure meters in the Sekonic official website. "Denki roshutsukei" (電気露出計, Electric exposure meters). Pp.102–3. Advertisement by Sanae Shōkai on p.105.